BMW Oracle's USA-17 wins the America's Cup, bringing it back to the United States. What a great bit of sailing, and a fantastic bit of engineering. 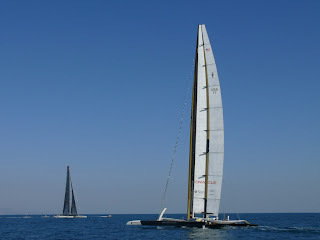 Alinghi gave BMWO a good race to the first mark leading for a good part, ending up trailing by 28 seconds. Then BMWO just marched away from them getting a 2km lead and eventually winning by over 5 minutes. In my uneducated opinion, Alinghi's only hope was for BMWO to make a big mistake, break, or have some super-bad luck with the wind. None of those came true.